Did you know that every 7 seconds a child starves to death?And that the total of people who die every day because of hunger is greater than 24000? These figures are terrifying but unfortunately they don’t have much impact on the media. If we compare these figures with the number of deaths due to Swine or H1N1 flu, the contrast could not be more stark. Hunger causes more than 24000 deaths every day and Swine flu has killed 125 people (up to today) since it was known about some months ago. This is not a criticism but something that I think we all should consider. And what can we do to reduce hunger in the World? That’s something that politicians should do, shouldn’t they? 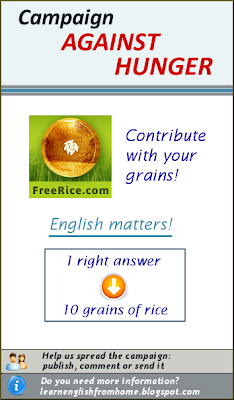 No, that’s a matter of EVERYONE and there are hundreds of things that can be done to help, from taking part into some organization, donating money, going as a volunteer to a country in need … to visiting a website (freerice.com) and answering different questions in a way that for every right answer 10 grains of rice, that will help to reduce hunger in the World, will be donated. With freerice.com you’ll help reduce hunger in the World and also, as the questions are in English, you’ll improve your level while you play. There are also questions related to other subjects (Art, Chemistry, Geography, Language Learning and Math). If you have played the “Brain Training “game you’ll surely like freerice.com. Try to reach the maximum level in all the subjects! I like the idea, can I participate? Sure, everyone is welcome. The more the better. A computer, a connection to the Internet and then visit the website freerice.com. But this is a campaign, isn’t? Yes, that’s why we are asking you that if you have a Web page, blog, radio, TV channel or any other media stream talk about this campaign to fight the hunger. If not, you can also make the campaign known by mentioning it to your friends. Ok, do you have a banner that I can use? Yes, we have made some of different sizes and languages (in English and Spanish) that you can use. And how are you going to check the participants and the total of rice donated? 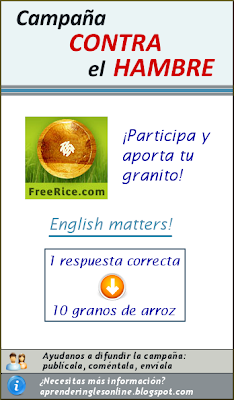 Every person or organization who participates can send an e-mail to aprenderinglesonline@gmail.com or learnenglishfromhome@gmail.com with their name, alias, Web page, Blog name or any other identification and the total amount of grains of rice that they have donated. Everybody will be responsible for keeping track of their own total of grains donated and can be informed anytime they wish. Participants will be added in this document. When is it the campaign going to finish? Well, the World Food Day is the 16th of October but it is a bit far ahead in time so we are going to say one month so the 6th of July the campaign will close and the total amount of rice donated will be counted. Is there any goal in the number of grains to donate? Yes, what about 100 millions? It takes approximately 5 minutes to donate 200 grains if all the answers are right so go on, we can make it. Is there a prize for the person or organizations that donate more grains? No, there are no prizes; the idea is to be generous and spend 5 minutes or more of our day to alleviate this truly human hunger pandemic in the World. We all win and especially those people that don’t even have a small dish to eat – they’ll be able to enjoy for once of something that should be a right and not a privilege. Those are really sad statistics. What a great thing your doing to increase awareness. Thank you for this. Great article, m off to visit freerice! @Collegegirl, thanks for your vote. @RML, freerice is a great idea. If you join the Campaign please let me know the number of grains that you've donated. Your blog is really cool. I like it. Mine shares English learning and teaching materials. So you're not a native English speaker? Your written English looks perfect! @0'Mama, many thanks for your feedback. I'm not a native English speaker, I'm Spanish. I get some help for my posts though. We are a charity that helps children in bali to complete school education but thanks for your email. Good luck, and we hope you do well!